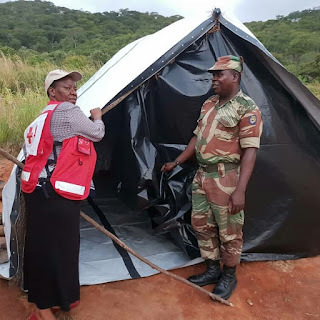 MEMBERS of the Zimbabwe National Army (ZNA) ordered Zanu PF bigwigs not to interfere with the distribution of food aid in Cyclone Idai-hit Chimanimani on Sunday to avoid the politicisation of relief efforts, the Daily News can report. This comes amid reports that youths from the ruling Zanu PF party have taken over food distribution in Ngangu, Kopa and other parts of Chimanimani that lie in ruins after the Cyclone Idai disaster. Over the weekend, a Zanu PF legislator was also accosted by angry villagers for handing out food aid to party faithful only. In the latest incident, ZNA members were forced to step in on Sunday after Zanu PF officials tried to give themselves a role in the distribution of aid, sourced through the Mayor’s Cheer Fund. Francis Mandaza, the public relations manager for Harare City Parking, who accompanied the capital city’s mayor Hebert Gomba to Chimanimani on Sunday to hand over the aid mobilised through the Fund, confirmed the incident. Mandaza told the Daily News yesterday that the army had to intervene after a coterie of Zanu PF officials had arrived in their branded vehicles to “assist” in getting the donations to the targeted beneficiaries. “The army officials had to tell them to go away because the issue was non-partisan. We thought it should be common knowledge that when such a disaster strikes, nobody should be seen to be keen on harvesting politically from that,” he said. Zanu PF spokesperson Simon Khaya Moyo said while relief efforts were being coordinated by the ministry of Local Government, officials from the ruling party may have genuinely thought they could help out. “They genuinely wanted to help because they could not have left people to starve, could they?” he said. Local Government minister July Moyo had earlier told the Senate that the sight of party-branded vehicles laden with goodies created the impression that the elites in the governing party were looting food aid. He also disclosed that officials from Zanu PF travelling to Chimanimani had been instructed to assist by carrying aid to where it is needed. “…unfortunately, if people end up carrying something with a car written Zanu PF, then it becomes a grabbing issue,” Moyo told Parliament on Tuesday. Zimbabwe is currently in mourning after Cyclone Idai ravaged parts of Manicaland and Masvingo – decimating homes and livestock. Over 300 people died in the tragedy with hundreds more unaccounted for. Reports suggest that Cyclone Idai victims who are known opposition MDC supporters are being denied food aid by Zanu PF apparatchiks. Zanu PF Chimanimani West Member of Parliament Nokuthula Matsikenyere was on Saturday allegedly accosted by angry villagers for distributing food aid along partisan lines. “I am surprised that people are saying only Zanu PF supporters received relief aid. Since the trucks that were carrying food arrived late, I personally requested that the teams from the department of Social Welfare, United Nations and Innscor start distributing food to people from Nyamusundu, Muusha, Chinamira and Utseya villages since they had to travel about seven kilometres back home. “Those areas are actually MDC strongholds. I did not get many votes there, so I am surprised that people would say we prioritised Zanu PF supporters,” she said. MDC party spokesperson Jacob Mafume yesterday condemned the partisan distribution of food aid.